Synopsis : The Disabled World Disability Blogs section focuses on your stories regarding disability, health, veterans, carers and related blogging of interest to persons with disabilities, their families, and caregivers, around the world. This section of Disabled World is a place for YOU to tell your story, and/or read other people's thoughts on how disability has altered their everyday life. Your story can be either positive, negative, or simply a place to place to express your thoughts freely. In this category we also list other Disability Blogs that can be found online, and that we consider provide substantial information and will be of interest to the worldwide community of persons with disabilities. Motivation: Defined as a theoretical construct used to explain behavior. It represents the reasons for people's actions, desires, and needs. Motivation can also be defined as one's direction to behavior or what causes a person to want to repeat a behavior and vice versa. A motive is what prompts the person to act in a certain way or at least develop an inclination for specific behavior. Inspiration: Defined as the feeling inside you that makes you want to try new things. It gives you hope inside and makes you see the world differently. If it's powerful enough, it can persuade you to do anything. Sometimes the person who inspires you could be a political figure, or a celebrity or even your parents. It could be anybody. 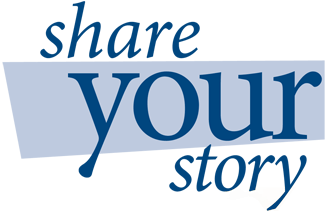 Text image reads - Share your story. Recently two big U.S. Super Bowl advertisements started a debate about whether disabled people can be "inspirational" for doing everyday things - or if the tag is condescending. What do you think? Perhaps you would like to write an article to be included in this section telling us your thoughts on the Motivation/Inspiration controversy? For many disabled people it is not necessarily the disability itself that so negatively impacts on their day-to-day lives but the response that society has to individuals with disabilities. Major life changes often require adjusting your sense of identity. Having a disability may mean you have had to adapt to a different daily life. Others, who may have lived with disability for the majority of their life, may be more adapted at self managing the changes. For some people the biggest problems that they now face as as a member of the disability community may be accessing locations or everyday items that may not have been designed or built in order to accommodate people with disabilities. Whatever your disability story is we want to hear about it, and if suitable it will be published in this section. To submit your story relating to disability send an email with story attached to admin@disabled-world.com. Keep in mind this area is not a place to report, complain, or "out" a particular person or establishment, so please leave any identifying names and places out of your story. Our Children Are Worth It - Should one consider the life of a person with a disability less valuable than the life of a person without a disability. Last of the Seven Summits - Making History for Hemophilia! - Mountaineer and Save One Life board Member Chris Bombardier is set to scale the Last of the Seven Summits, Mt. Vinson, becoming the first person with hemophilia in history to climb all Seven Summits. Chef with Disabilities Continues Career Using Stand-Up Wheelchair - Vocational Rehabilitation story of a man who was able to return to his career with the help of assistive technology. Amputee Model Breaking Barriers in Fashion and Shattering Stigma of Disability - Amputee model Shaholly Ayers is breaking beauty barriers and is currently featured in the Nordstrom Anniversary Sale catalog. Big Dreams, Great Job at Minnesota Best Buy for Man with Cerebral Palsy - Mongolia native finds Best Buy job with help from ProAct, leads smartphone app session for disability leaders, selected as national conference panelist. Citation: Disabled World. (2019/03/06). Disability Blogs: Stories and Writings Regarding Disabilities. Retrieved 2019-04-22, from https://www.disabled-world.com/disability/blogs/ Direct Link: Disability Blogs: Stories and Writings Regarding Disabilities - The Disabled World Disability Blogs section focuses on your stories regarding disability, health, veterans, carers and related blogging of interest to persons with disabilities, their families, and caregivers, around the world.